One of my families favorite meals. It's so versatile. When you make this saucy pan of meat it's the start of so many meals. The possibilities are endless and so are the leftovers! If you do have any the next day. Put the meat in the food processor for the perfect bolognese sauce! 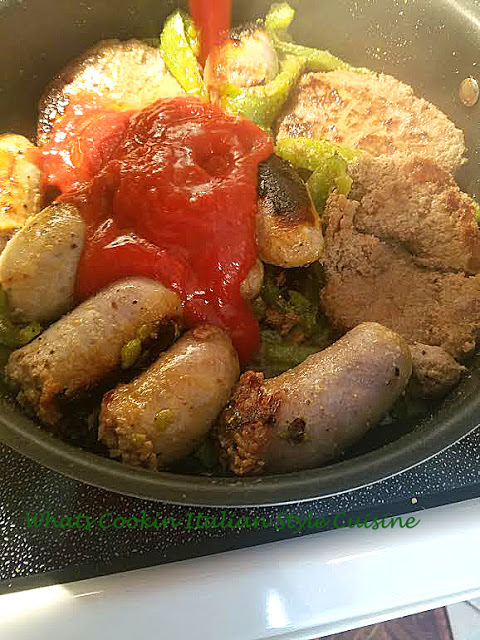 Whatever you feel like eating tonight whether it's a sub sandwich, over mashed potatoes, on top of rice or your favorite pasta you are sure to please everyone in your home with this starter dish of delicious meat sauteed in this awesome sauce! In a deep dutch oven or extra large fry pan, add 3 tablespoons olive oil and cleaned whole garlic. Saute until garlic starts to brown. Remove from oil. Add the peppers, meats and saute until browned. Season with salt, pepper, granulated garlic and some fresh chopped basil and parsley evenly over the top of the sauce. 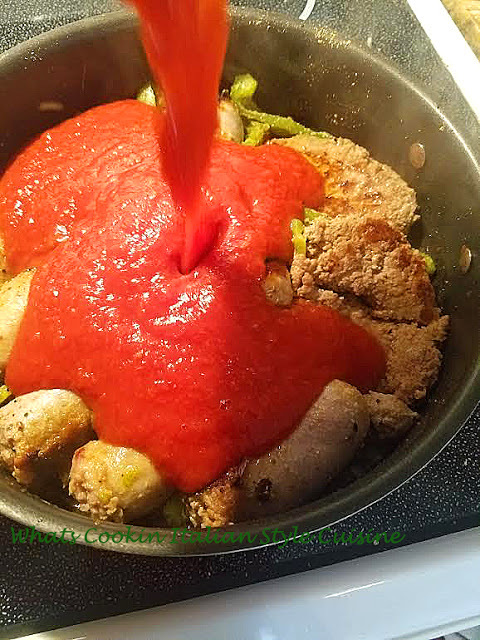 Add the fresh tomatoes and simmer on low until the sausage is cooked around 35 minutes. Serve over cooked pasta, in a roll as a sandwich, over mashed potatoes or with cooked rice. If your family has another idea to use this for I would love to hear from you too! Something for everyone! What delicious comfort food!